Last year, I released a Bootstrap 4 Course, but it was in alpha back then. Literally 2 days ago, (January 18), Bootstrap 4 released to its full 4.0.0 version. With that said, this provides me with a great opportunity to create a brand new crash course to help everyone get up to speed with the first full version of Bootstrap 4. This course will be in no way comprehensive, rather, it will help you get up and running as quickly as possible while having the confidence to read and understand the documentation. I will show you how to integrate it through two different methods, and then start building a layout while referencing the documentation. For our project, we're not going to use this method, because while it is quick, it doesn't afford you the ability to use Sass. If you just need Bootstrap for the purposes of quickly prototyping, it makes sense to use the CDN method. This is straight from the Bootstrap 4 Getting Started page. 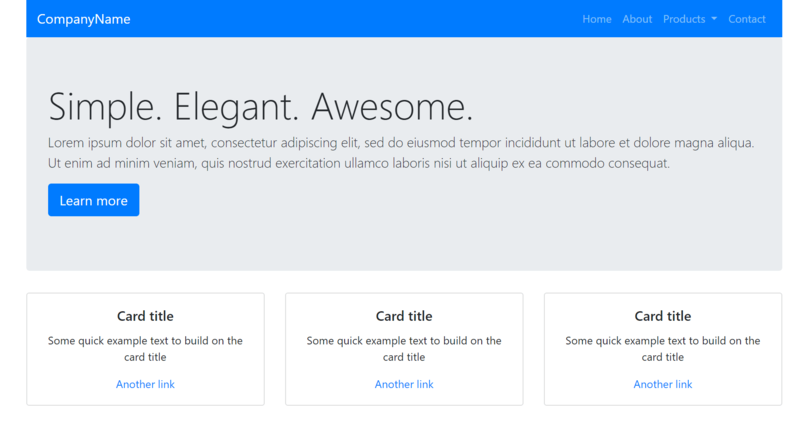 With this template, you can get started using Bootstrap right away. 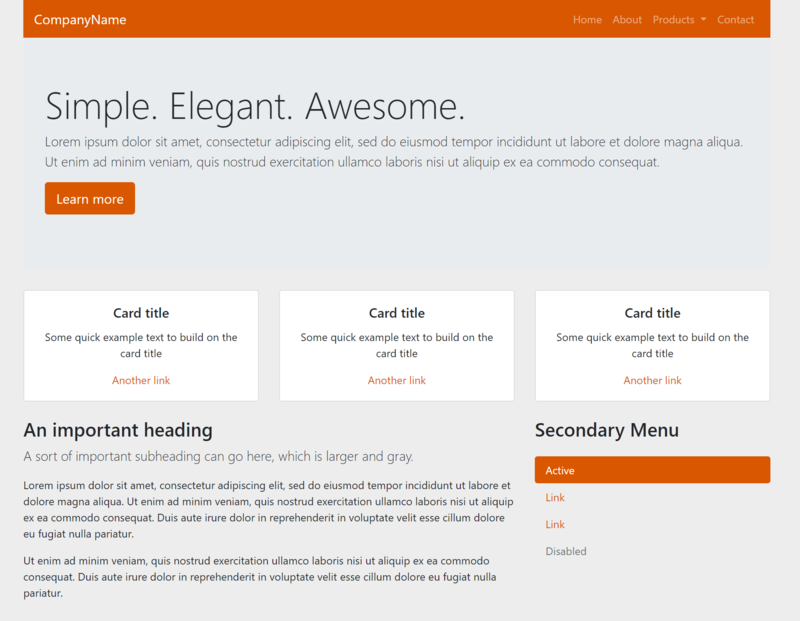 The benefit is it's simple to get started, but the downside is that you lack the customization that Sass offers. We're going to start our project right here at this stage. This will require using Node.js and its package manager to install bootstrap itself, along with a few other packages. This will give us access to Sass, live browser reloading, etc.. If this goes unrecognized, visit Nodejs.org and click downloads. Download the appropriate installer based on your OS and follow through the installation process with the default options. Once complete, reload your console or command line and you will have access to thoe node command. Next, we're going to run npm init to create a package.json file, which simply stores our dependencies. browser-sync automatically refreshes our browser for us upon file changes. gulp-sass enables sass compiling with our project. 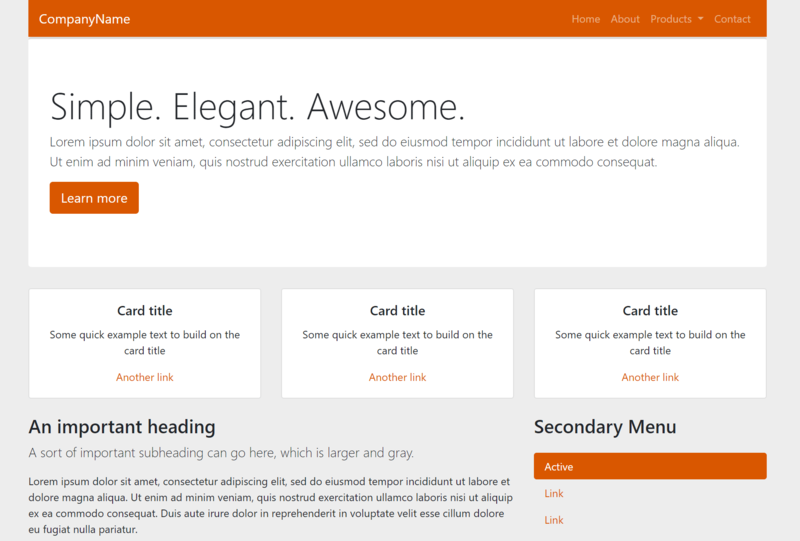 bootstrap of course is the bootstrap package. jquery is used by bootstrap. popper.js is also used by bootstrap. It allows for positioning of popovers, tooltips, etc..
Next, open up your code editor. If you're using Visual Studio Code, simply type code . in the command line within the project folder and it will launch the app. Inside of /src, also create the 4 folders proceeding it as shown above. So, we have a few things happening here. I'm importing the Raleway font along with FontAwesome for icons. Then I'm referencing bootstrap.css itself and a styles.css file. These don't exist yet, but they will shortly. default task - When we type gulp in the command line, this is telling it to run both the js and serve tasks. serve task - The serve task launches a simple server and watches our sass files, and if any are changed, it calls the sass task. It also calls browser-sync when any * .html file is saved. sass task - This takes both of the bootstrap sass files and our custom sass files and compiles them into regular CSS, and stores those CSS files into our /src/css folder. Whew, that's a lot of work, right? Well, fortunately, we're done with the setup. With any luck, http://localhost:3000 will load up in the browser and your background will be bright stinking red! This means everything should be good to go. The starting point of your Bootstrap 4 project is almost always going to revolve around the grid container. The .container class allows you to horizontally center your layout. Alternatively, for a fluid layout (100% width), you can use .container-fluid. Also, remove everything from your styles.scss as we don't want a red background. If you look at your browser and get out the inspector (CTRL-SHIFT-i on Chrome), click on the element selector icon, and hover over the "test" text, you will see the outline of the container. 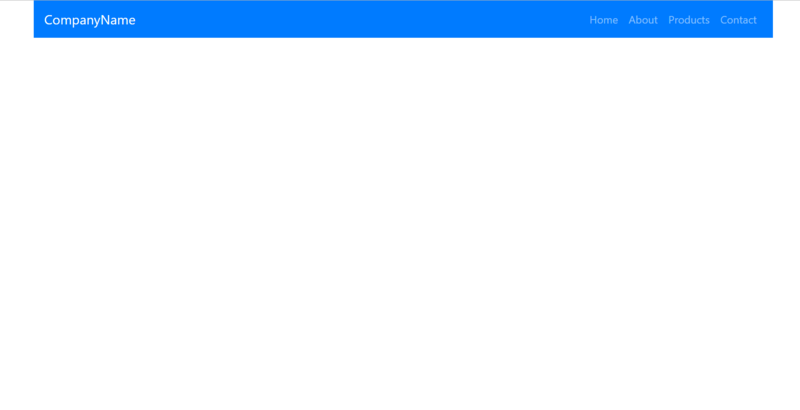 This is a responsive container, so, you can shrink the width of your browser and observe how it reacts. 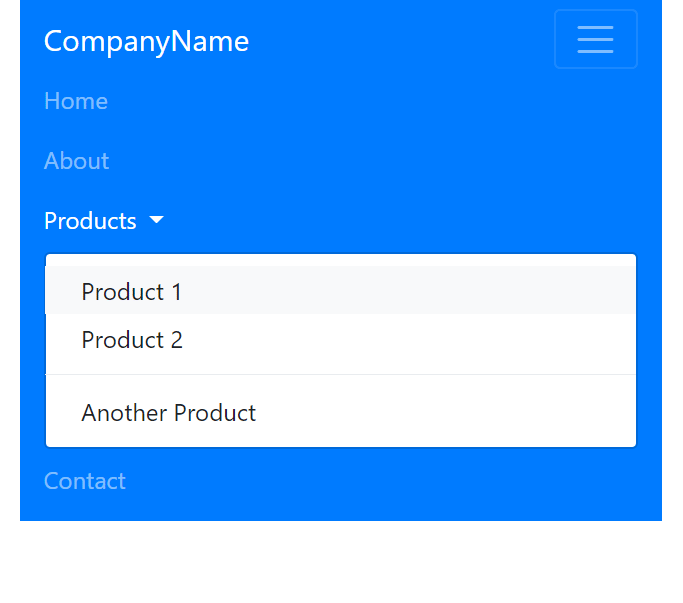 After defining a container, the next most likely section section of your layout will probably be a navigation of some sort. In Bootstrap, this is referred to as a navbar. Note: Check out the Navbar Documentation. The Documentation for every Bootstrap 4 element is quite comprehensive. It provides you with examples along with the associated code. Most header navigations include a company logo, usually left-aligned. We will also include a navigation that's right-aligned. Easy! Right now, our navigation lacks a button on mobile devices. So, we have to add the HTML necessary for that to work. As you can see, it's incredibly simple to build out a robust, responsive navigation with Bootstrap 4. 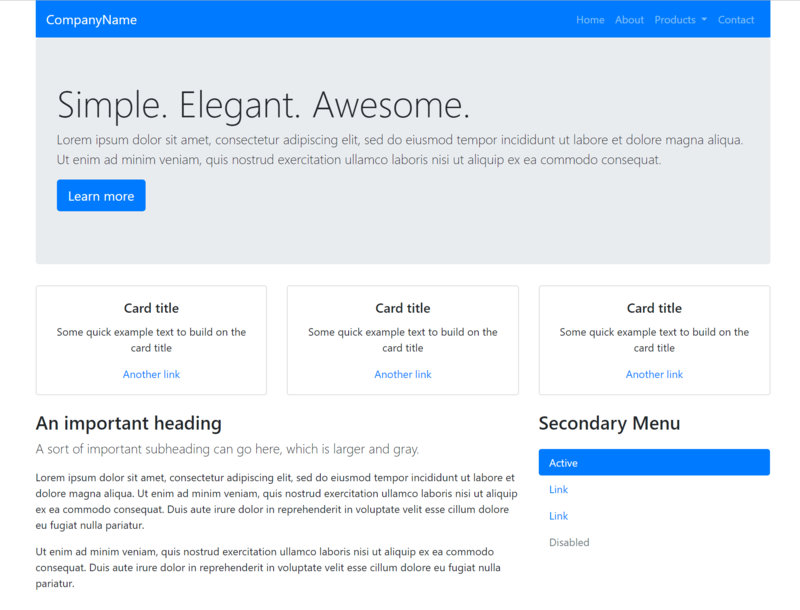 A next common element for many layouts and landing pages is a hero section. In Bootstrap 4, this is referred to as a Jumbotron. Most of this HTML was taken from the Jumbotron documentation, but I simply modified and removed some of the elements to suit my needs. For the most part, you can do this for any other needed Bootstrap 4 element, as their documentation provides you with plenty of examples. Is it cookie cuter so far? Yes, does it have to be? No, and you will see how we can make customizations later on. Perhaps the most important aspect to understand when it concerns BS 4 is the grid system. It's based on Flexbox, and if you're wondering, no -- the grid system in BS 4 is not based on the new CSS grid, unfortunately. Bootstrap 4 was developed for years and they were already dedicated to Flexbox. At this point, Flexbox is a safer bet, being that the CSS grid is supported by 76% of browsers and Flexbox is at almost 100%. 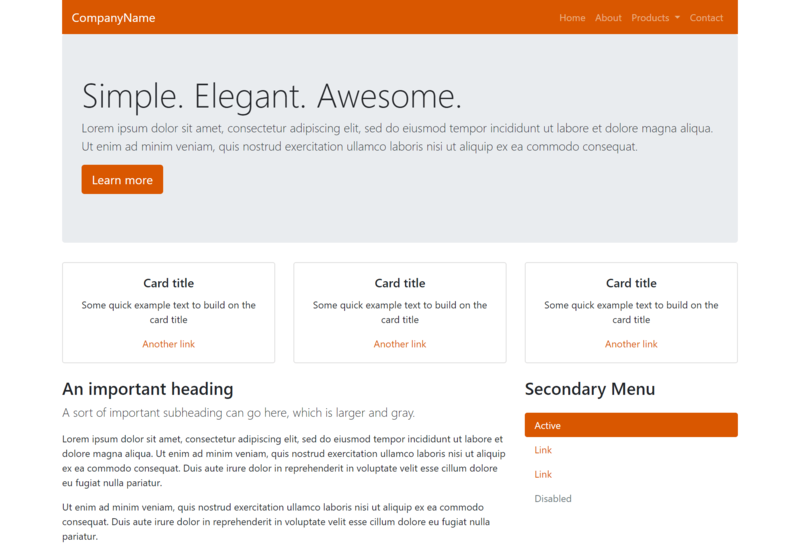 The Grid Documentation is very detailed with a ton of options and examples. Be sure to refer to this page whenever you have certain needs. These are all equal width columns, which is achieved by simply specifying a class of .col onto each column. We don't want that, though. So you can remove -6 from the middle column. Right now, if you adjust the browser to a mobile viewport, you will see that our grid is not responsive; they remain in 3 columns. We first specify .col-sm-12, which means that on small viewports, this column will take up all 12 columns. There is, of course, a lot more to learn about the Bootstrap 4 grid system, but that is the general gist. You use a variety of grid classes to define the amount of rows a column should assume on a given viewport. 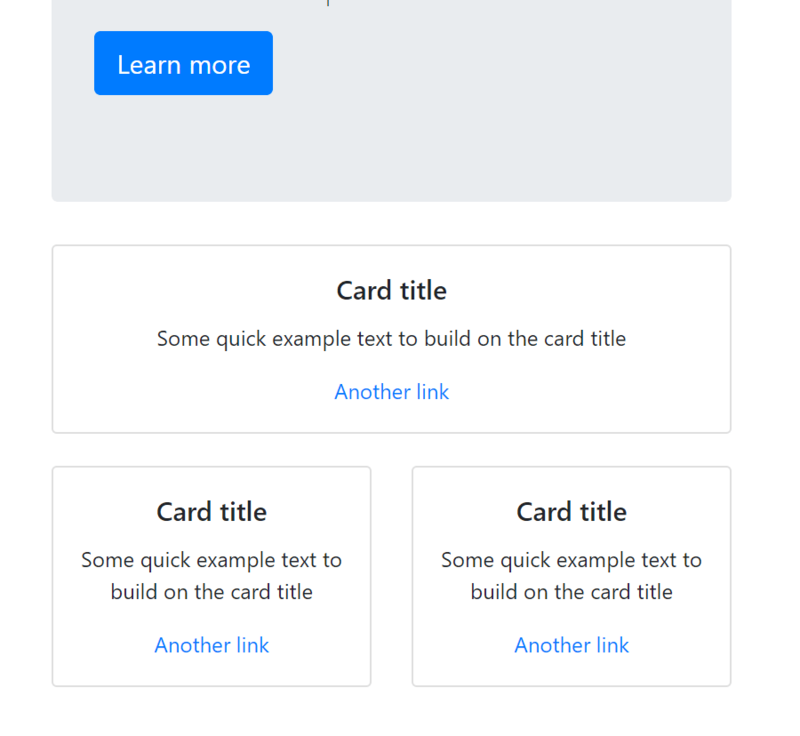 Notice in our example image above, there's no margin between our card elements? If you ever need to add either margin (the space outside of an element) or padding (the space inside of an element) you can use the margin and padding helper classes. Following m or p you add either: t (top), b (bottom), l (left), r (right), x (left and right), y (top and bottom), or nothing for all 4 sides. After a hyphen, you specify sizes 0 through 5 (5 being the largest amount of spacing). 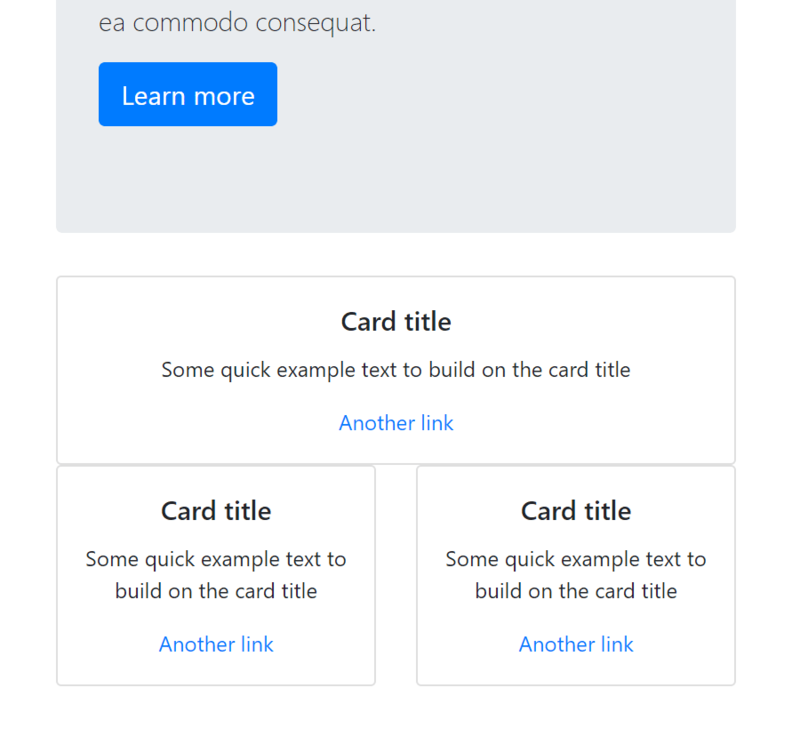 So, in our example, it looks like we need to use margin and bottom to push away the cards beneath it. That's how you can easily handle both margin and padding in Bootstrap 4. Let's gain some more experience using different Bootstrap 4 components. Let's add a section beneath our 3 columns, at the end of the closing </div> for the row class which will have 2 columns. The first column will assume most of the columns (8) and the right column will be for a vertical navigation in the section after this. Bootstrap 4 has a Typography section in their Documentation that will provide you with all of the type-based helper classes. It's fairly straightforward. We're using .lead to place emphasis on a subheading underneath our h3 element. There is also a Text utilities section in their Documentation that provides you with text alignment options, transform, italics and font weights. On small viewports, let's say that we want our type to be centered instead of the default behavior, which is left aligned. This will result in the text contained within the div to be centered on small viewports and left aligned on medium and larger. You can also check it out on smaller viewports and notice that it's perfectly responsive. There are, of course, a lot more options associated with navigations. We now have a pretty standard layout that you might find on most websites. The problem is, it's very cookie-cutter. Fortunately, Bootstrap 4 has a robust system that enables customizing common elements quite easy. According to the Theming section, you can choose to either include all of the Bootstrap 4 sass files, or you could include individual items based on your needs. To keep things simple, we'll just import everything as we have above. Perhaps the most common theming need is to change the colors. If you open up the node_modules/bootstrap/scss/_variables.scss file, you will notice at the top it mentions Color system. In this section, you will see all of the variables that you're able to overwrite that to pertain to colors. Hmm, now, our jumbletron (hero) section looks ugly, as it was also gray. We can make custom adjustments to specific elements by using the inspector in chrome or firefox, finding the associated classes of the elements we want to change, and changing those in our styles.scss file. Hopefully you enjoyed this crash course / tutorial on Bootstrap 4. We only scratched the absolute core fundamentals, and there's plenty more you can learn. At this point, anything else you need to learn should be simple, as now you understand the basics and that almost everything is covered in the documentation.